Polyester with Elastic Rubber Trimming. Other Colours Available. Various Colours Available. Minimum Quantity: 50. Conforms to Eu Standards Phthalate Free. Minimum Quantity: 250. Showcase your logo and promote your brand with our high quality sports products featuring sturdy design, attractive look and uniqueness. These products are the most appropriate way to send a powerful branding message across a large number of clients. The variety of premium quality sports items available with us include bicycle lamp, bicycle luggage set, bicycle frame bag, beach tennis game set, promo football, cricket bat inflatable beach ball, led shoe light and various other products. 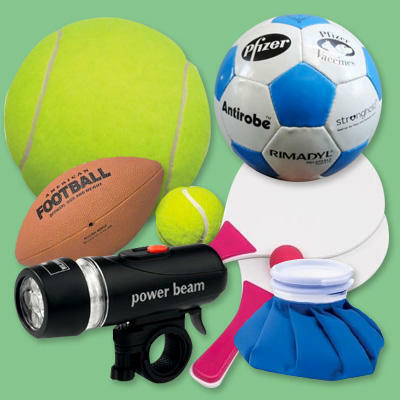 Choose your choice of products from our range of promotional sports products that you?ll think will work best for you. Our experts can even custom design a product to impress your clients and promote your business.